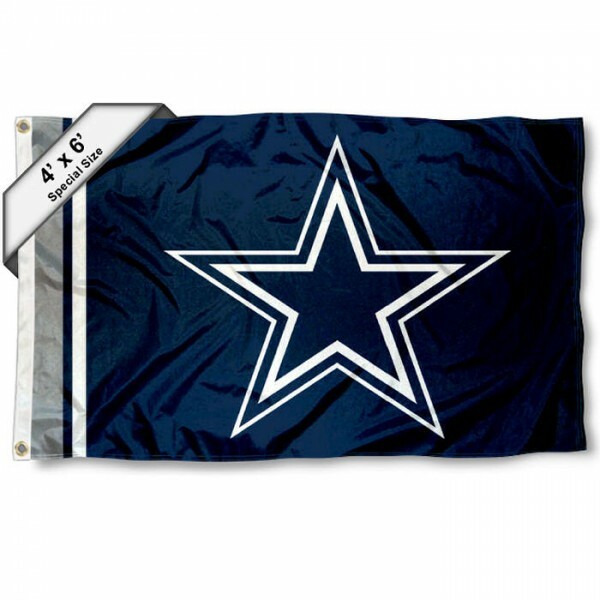 Our Dallas Cowboys 4x6 Flag is made of 100% polyester, is a large 4x6 feet in size, has sturdy quadruple-stitched fly ends, and 2 metal grommets to attach to your flagpole or any of our tailgating flag pole systems. The NFL Officially Licensed Team Logos are screen printed into our Dallas Cowboys 4x6 Foot Flag which results in a durable and quality flag. This Dallas Cowboys 4x6 Flag will show the entire neighborhood your team allegiance and can also be used as a large wall decoration. Fly this 4x6 Flag with your flagpole or any of our 16', 21', or 28' tailgating flag poles.